Catching trout on a lure or bait can be tricky. There are so many lures for trout available that often it is difficult to know what to fish with and when. What lures are going to reliably catch the most trout? What is the all time best trout lure? We have listed the top 5 trout lures. Each has been carefully selected for its proven ability to catch trout on a regular basis. What is a good lure for trout? Choosing lures for trout fishing will largely depend on the season and type of water you will be fishing or whether you will be fishing from the bank or trolling for trout from a boat. We have profiled each type of trout lure in a separate guide and how best to use them when trout fishing. Having the latest cool fishing gear and the best tackle is all well and good but you need to know how to fish for trout to get the best out of your time on the water. Hopefully our guides can help you gain a little edge on your next fishing trip. There are plenty of other lures that are good for trout fishing such as crankbaits and softbody lures that aren't quite as popular and so didn't make out top trout lures list. Here is out list of the top trout lures. On this page you will find our top pick for each type. You can also find a link to more in-depth guide for each type of trout lure. These lures for trout have stood the test of time and produced time and time again. You may also choose some as fishing gifts if you are stuck for ideas. Trout spinners are one of the most effective and versatile trout lures. You can use them trolling for trout or casting from the banks of rivers and stream. When spinning for trout you can cover a large body of water, which can greatly increase your chances of tempting a trout to strike. Spinners work by enticing the trout into biting by a combination of flash and vibration. There is an almost endless choice of colors, size and types available, choosing can be overwhelming. The conditions and type of water you are fishing should determine which attributes of the spinner you pick. When fishing a spinner the speed of retrieval can have a big impact on how the trout spinner fishes. If fishing it slow then as the blade spins the vibrations will be less frequent but the body of the spinner will be more visible, if fishing it fast then the vibration and flash will be more pronounced but the body color won't be as noticeable to the trout. When rigging a spinner the majority of fishermen will just tie it to the end of the line, each spinner will fish at its natural depth depending on the weight of the spinner and how fast it is retrieved. If you need to fish it deeper and are casting the spinner you can always attach a shot weight several feet away from it, the further away the more natural it will appear. If you are trolling you can use a down-rigger to help set the depth. Varying the speed can be very effective as sometimes a trout will strike just as you slow it down. The Panther Martin is one of the best all time trout lures for spinning for trout fishing. It is somewhat heavier than other spinners of it's size and the angle at which the blade spins allows for them to run deep. It is a great lure for streams in the smaller sizes. So, if you are chasing river trout in deep holes are pockets this is definitely one of the best spinners to try. You can practically cover most spinning scenario's with just a handful of these lures. One of the top trout lures ever made! Next on our list of best trout lures are worms. Worm fishing is one of the all time great ways to catch a huge variety of fish and trout are no exception. Using live worms in rivers and streams can be a very effective way to get picky trout to feed. Not only are worms effective but they are also one of the easiest methods to use so you can teach a child in the space of the afternoon. However soft plastic worms can be deadly. It's only in the past decade or so has the use of artificial worms in this way exploded in trout fishing circles. Worms are available as both scented and unscented. Personally I would always choose the scented as they have definitely proven more successful over the long run. Berkley claim that "PowerBait makes novice anglers good and good anglers great" I don't know about that but their PowerBait infused worms are a sure fire winner! They are particularly good at catching stocked fish and Rainbow trout love em. The most under-rated trout lure that is hardly ever used! Jigs can come in all shapes and sizes and made from a wide variety of materials. Some jigs are made from feathers, fur or soft plastic and are extremely versatile. And if you want to make your own all you need are some pre-made jig heads and the simplest of fly tying techniques and materials. A lot of trout fishermen however still continue to use spinners and spoons as their main go to lures. Jigs are undoubtedly the most versatile of lures to catch trout with. The best trout lures should be as versatile as possible, jigs can be fished shallow or deep and fast or slow and are usable year round on pretty much any river or small lake. 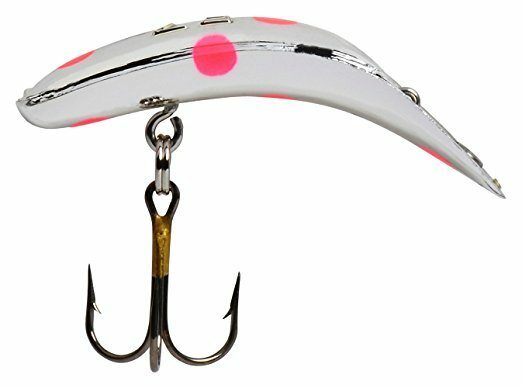 Other lures have their action built into them, spinners have their blades, and the shape of spoons determines how they weave through the water. With a jig however you can tailor the action to mimic what you are trying to imitate whether that's a small olive nymph with something like the Woolly Bugger or an injured minnow using a small soft bodied jig. A Woolly Bugger with enough weight in the head bead can be easily fished on light trout fishing gear. It is a great nymph imitator and when trout are not keen on taking bait fish type lures anything that represents the other invertebrates that a trout will naturally feed on might just give your fishing the boost it means. These can be used in small streams and rivers by bouncing them off the bottom and letting the current do the rest. A good trout lure to imitate a wide variety of sub aquatic food. Trout spoons come in many shapes and sizes, selecting the best for your given venue and water conditions really can make all the difference between landing a fish or going home empty handed.There are many reliable methods to catch more trout, using a spoon is just one of them, spoons have been tried and testing for a long time. Spoons can either be trolled in a large lake in deep or shallow water depending on the season or they can also be cast when fishing a stream or river. Undoubtedly spoons are pretty simple, a convex piece of metal with a hook(usually treble) on one end and attached to your line on the other. You can use silver or golden/copper spoons to great effect or you can choose one of the many artificial looking patterns that can also work really well. A trout lure that has stood the test of time. The Dardevle spoon must be one of the most owned lure in fishing history for many years they were in pretty much every tackle box. The original red/white pattern has got it's fair share of fish for many over a century. These fishing spoons are versatile enough to cover most sized fishing venues, small sizes on rivers, larger on lake. Trout like nothing more that attacking smaller fish or minnows, any lure that can imitate it will do good. Lures that aim to replicate these smaller prey fish are often called minnow plugs, stickbaits or depending on the shape jerkbaits. However one brand of trout lure is synonymous with these lures and that is the Rapala, so much so that these lures can sometimes be called Rapala like lures. Rapala lures come in several variations and color combinations. There are floating and sinking models and each can be used to great effect in the right water/weather combination. A Rapala can be cast in a river or stream on light spinning gear or they can be trolled in shallow waters when trout move in on small fry or trolled deep in larger sizes to target big wild trout in large lakes. All of the above makes the Rapala lure one of the best to have in your tackle box and it can be a great fallback lure when flashier lures fail to produce. A great lure that performs, our favorite picks would be either the classic gold, silver or brown/rainbow trout models. The choice of sinking or floating depends on the depth you are looking to find the fish at. And size wise on rivers the 3 and 5 smaller ones are ideal, whereas for trolling on a lake the 7,9 or 11 should cover most big lake trout. One of the all time best trout lures to have in your tackle box. ​Flatfish lures have been used for trout fishing since the 1930's when they were first designed by Charles Helin. They can be particularly effect for trolling on big lakes. A common approach is to use a down-rigger or lead core line to really get the lures down deep. Occasionally you will see a lead weight used to force the lure down deeper. You need to be very careful with this approach as it may end up altering the swimming action of the lure it it is placed to close to it on the line. The flatfish lure has a very distinctive wobble or action that and it can be trolled a variety of speeds up to about 3 mph. The are one of the most reliable lake trout lures available. Some of the biggest trout caught in large open lakes have been tempted to strike by one of the dotted patterns available from Yakima. You can choose the main body color depending on the prevailing conditions and the depth you intend to fish. Just be sure that that the color of the dot contrasts nicely with the main body color of the flatfish lure. Before there was any kind of trout lure there was natural bait. Fishing with a natural bait is centuries if not thousands of years old. In the right conditions it can trump any artificial lure you can through at the trout. There is a wide variety of bait that can be used for trout fish​. Ideally you would try to match the local insects or smaller fish to the stretch of water you are fishing. Failing that you can even use artificial products such as Powerbait. Even simple things that are on hand in most kitchens can be very effective bait for trout. ​Simply rigging a bit of corn on a hook and bouncing it downstream without any weight is a super effective way to target trout. ​Fishing with bait is one if the simplest forms that you can try. This simplicity is what makes it a great way to introduce kids to fishing. Steelhead can be caught on a number of different types of lures and bait. Steelhead lures are a little different than regular trout lures. They will mostly differ in size but there are some techniques that are almost exclusive to steelhead fishing. When you fish for trout in the winter out on the ice the type of gear you need and how you fish changes somewhat significantly from the normal spinning you do during the other seasons of the year. Your normal setup if probably not going to usable except for maybe the reel. A dedicated ice fishing rod and ice fishing line are required. Along with a selection of ice fishing lures. Other tackle that is required can be tip ups, an ice auger and even a flip over ice shanty. Fishing with trout lures is an active pursuit and you do need to be prepared to move around a bit and find the best spots. Trout will tend to lie in wait of passing insects and small baitfish. Most of the trout lures here can be fished on ultralight spinning gear or trolled down deep in larger sizes on lakes. Be sure to match your rod and spinning reel to a suitable line strength. A good ultralight trout reel and suitable trout spinning rod ​should be able to cast light lures a good distance with great accuracy, you can also purchase your rod and reel as a combo. In general if you are fishing for trout on rivers or streams then a 2-6 lbs line should be sufficient. You may also use this strength fishing line for trout on small lakes. If you are trolling then you will need something that is a bit more substantial. When looking to get you trout lures down deep you may need the aid of either a down-rigger or a lead core line. We hope you have enjoyed our introduction to the best lures for trout. Please feel free to check out our more in-depth guides on each lure for trout fishing. We have tried to include the best information on each trout lure, how to fish it and a brief overview of the tackle required to fish them correctly. Copyright text 2017 by Best Trout Fishing Lures. Best Trout Fishing Lures is a participant in the Amazon Services LLC Associates Program, an affiliate advertising program designed to provide a means for sites to earn advertising fees by advertising and linking to Amazon.